Incurable astrocytomas, including the particularly malignant glioblastomas, diffusively grow like mycelium into healthy brain tissue. Therefore, these tumors cannot be completely removed by surgery and invariably start growing again at some point despite intensive treatment. They appear to have effective resistance mechanisms. For up to one year, the researchers observed the growth of human glioblastoma cells that they had transferred to mice. They used a special microscopy technique that facilitates insights into the brain’s deep zones. In this way, they discovered that the cancer cells exchanged molecules via their membrane microtubes which they also used as communication channels. 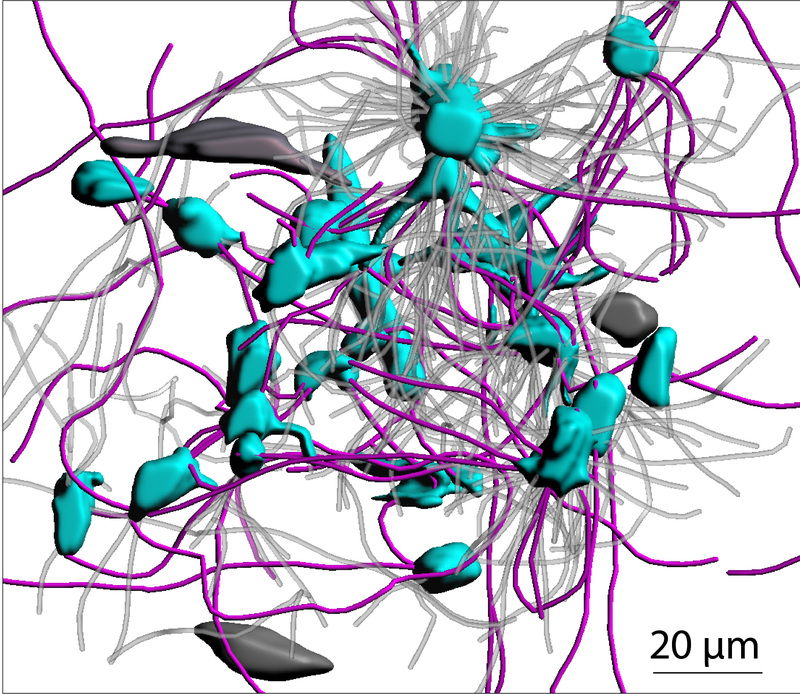 The scientists therefore hypothesized that the tumor microtube networks must be linked to therapy resistance. They observed that the tumors in fact recognize damage to the network and repair it immediately. Radiation therapy – the standard treatment in glioblastoma – fails to kill mainly the tumor cells that are part of the network, whereas cancer cells outside the network die. How do the tumor cells form these extraordinary membrane extensions? An analysis of the gene activities in tumor tissue from 250 brain cancer patients provided a clue. For building their network, the cancer cells make use of specific molecular signaling pathways that are normally active during early development of the nervous system. Experiments in which the scientists blocked these pathways in mice showed that the animals subsequently developed smaller tumors with fewer interconnections that responded very sensitively to radiotherapy. 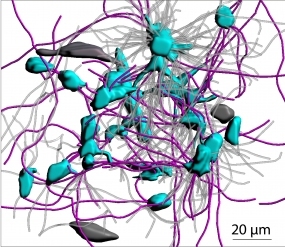 Caption: 3D-Illustration of a glioblastoma: Interconnected tumor cells (blue) with the connecting microtubes (pink). Tumor cells and microtubes outside the network are grey (Source: Nature).